This intensive course is designed for anyone desiring to develop more accuracy and self-confidence when communicating using English. 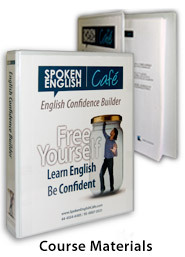 English Confidence Builder will help you speak English more naturally and confidently. Anyone with some basic knowledge of English who is seeking more confidence and accuracy speaking English. Note: To enroll in a Café course, you must have completed at least the 10th standard. Know the rules to speak correctly. Learn to use the English knowledge stored in your mind. Improve your comprehension through regular exposure to local and mother-tongue voices. Expand the words you know and can use. Sound more natural and be more easily understood. Learn how to write and deliver effective presentations with weekly practice. Sessions are 2 hours each, three sessions a week. We expect English Confidence Builder students to be prepared to work hard, as homework is assigned daily. Beyond the classroom, students should plan to study at least 30 minutes a day. Batches are limited to 15 students. To find out more or to register for an upcoming batch, please contact the Café.